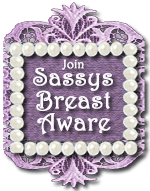 momfamilychild-help: Join Sassys 'Be Breast Aware Award'! So u noticed that sassymamas site is looking a bit purple this month? join our campaign to raise 'breast awareness', as part of the Breast Cancer Foundation of Western Australia's 'The Purple Boot Brigade'! Please COME AND JOIN our SASSY PURPLE LIPSTICK CREW! sassymamapaulak is proud to support 'The Purple Boot Brigade' Campaign, an initiative of the Breast Cancer Foundation of Western Australia. 4. add your name to our support campaign list at sassymamas....let's show Ness from the Breast Cancer Foundation of Western Australia's 'The Purple Boot Brigade', the strength & support of OUR sassy mamas!!!! 1. www.ofmiceandramen.com Veronica you are 'so sassy' because you are 'extremely loyal'! 3. www.colleenstearns.com Colleen you are 'so sassy' because you 'show true strength & leadership'! 4. www.mommosttraveled.com CC you are 'heart sassy' because you are so 'compassionate & always thinking of others'! 5. www.threeprincedesigns.com M you are 'tres sassy' because you have the ability to 'step up to the plate & get the job done'-I appreciate you! sassy mamas, please collect your award code from my side bar and pass this Award onto 5 sassy bloggers who also deserve it...you will make them feel 'sassy special ' PLUS raise 'BE BREAST AWARE'!!! Thanks Paula. I'm a little behind in my 'acceptance speech' for awards.I shall blog about them in between my posts. I have an award for you too. Grab it from the top of my blog next to the running mouse. It's made by my 9-year old son. Aww, thanks for my special Heart Sassy award! Sometimes I wonder if being tender hearted is good for anything other than pain! Thank you Sassy Mama!! I appreciate you so much and hope you are starting to feel better.